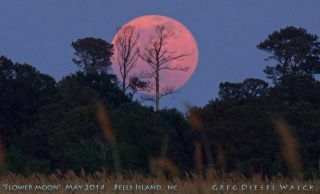 Astrophotographer Greg Diesel Walck sent in a photo of the full moon rising over Bells Island, NC, on May 15, 2014. A stunning full moon rises over Bells Island, North Carolina, in a serene combination of earth and sky in this amazing photo captured by a veteran astrophotographer. Photographer Greg Diesel Walck captured the amazing moon photo on May 14 during the Full Flower Moon of May. "[The location] was a small country road and … drivers actually pulled over to watch [because] it was a spectacular moonrise," he added. The full moon of May gets its Flower Moon name from the flowers usually bloom in abundance during this time, according to the Farmer's Almanac. The May full moon also has several other names, including "Full Corn Planting Moon" and "Milk Moon." Walck used a Sony A77 camera on a tripod with a remote release. On Facebook, Walck mentioned that he will release a version of this image on canvas.